While Prime Minister Nawaz Sharif is packing his bags for his upcoming US visit and giving final touches to various briefs and talking points, it is increasingly being felt that all is not sugar and honey between the two long-term allies. And if there was any doubt, Pakistan’s NSA has confirmed it by alleging that the US is fanning instability in the South Asian region. Days before his departure for Washington DC, Mr. Sartaj Aziz said that the US can maintain whatever kind of relations it wishes to with India, but at a time when Pak-India relations are tense, the super power should not increase strategic and conventional imbalance in the region to the extent that there is a threat to regional security. He said that many countries, including the US, wanted Pakistan and India to resolve their issues through dialogue, but for that it was important there was no regional imbalance. This statement sets the mood for talks to be held between Pakistan and the US and it clearly shows that, if there is no Ufa again, both are going to talk tough. Pakistani delegation comprises of heavyweights like the PM, COAS, NSA and DG ISI. The catchphrase used by Aziz is (strategic and conventional) imbalance. It means that Pakistan would do whatever it takes to resist it wing-clipping. The talks are about security; of Pakistan and its strategic assets. The only thing Pakistani side will need to deal with its hosts would be diplomatic excellence and political shrewdness. Does this mean that the Americans are trying to put their entire weight behind India and will try their level best to make Pakistan accept Indian hegemony in the region? Absolutely. 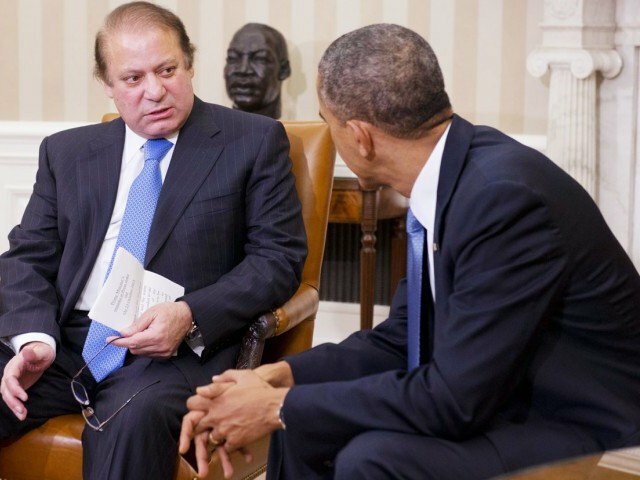 Do they really want Pakistan to restrict its nuclear arsenal? Yes, because that’s how India can attain hegemonic position. Pakistan’s nuclear program is admittedly of superior quality which can deal with any type of threats, both strategic and conventional. But it’s not about the entire nuclear development program which the US is worried about. According to The New York Times, American are concerned that Pakistan might be on the verge of deploying a small tactical nuclear weapon — explicitly modeled on weapons the United States put in Europe during the Cold War to deter a Soviet invasion — that would be far harder to secure than the country’s arsenal of larger weapons. This tactical nuke that the Americans are so worried about is an effective response to conventional threat of Cold Start doctrine to invade Pakistan which India is shortly going into massive military maneuvers to test. Whatever the pressure tactics and arm-twisting, Pakistan would not budge on any of the demands relating to its nuclear arsenal. The tactical nukes like Nasr are Pakistan’s effective and credible deterrence against any misadventure from India which Pakistan cannot give up. Pakistan’s tactical nukes not only strengthen Pakistan’s defenses, these also reinforce the defenses of China with which India shares a troubled border. It is now a well-known fact that the Americans have outsourced its China-containment enterprise to India in return for a Civil Nuclear Deal. For this purpose, the US will strengthen India to make it a bully in the South Asia and Far East Asian region. Pakistan is the only stumbling block and it’s important for the US, for its own sake as much as for the sake of India, to put a cap on Pakistan’s nuclear development which effectively means try to deprive Pakistanis of their competitive advantage over India of having a solid fuelled tactical ballistic missile named Nasr. Nasr is not the only reason for Pak-America strained relations; Pakistan, a Cold War ally of the Americans, may have outlived its utility because it was good to fight the Cold War against USSR or Afghan Jihad but it is totally unsuited to China-containment. Conversely, Pakistan is strengthening Chinese economy through China Pakistan Economic Corridor (CPEC) which will provide a shorter land distance to China to import oil and export commercial goods. A prospering Chinese economy is not only an economic but also a military threat to both India and the US. Besides, CPEC will also boost Pakistan’s economy reducing its dependence on American aid or multilateral loans. That the effectively independent Pakistan is of no use to Uncle Sam has already dawned on their strategists. It would, therefore, serve American interests if the region, particularly Pakistan’s Balochistan province remains unstable. Balochistan is a resource rich but most backward province of Pakistan. There was always one insurgency or the other to keep Pakistan or its allies from exploration of mineral wealth. The tribal chiefs first fought for USSR and then US-India-Afghanistan-UAE nexus with each country having its own interests in the province. The province has China-built deep-sea port of Gwadar which will realize Chinese dreams of CPEC. When fully developed with associated network of railways and roads, the port will potentially hit hard the commercial interests of Dubai trans-shipment port. If developed as a naval base, it also fits into the String of Pearls strategy so well that it effectively defeats the encirclement doctrine of India. CPEC envisages transforming Balochistan with nearly everyone having access to basic necessities of life. Pakistan’s para-military forces have already successfully curbed India-funded insurgency with most of insurgents having surrendered already. People of Balochistan have first right of ownership of the mineral wealth of the province and the government has to make explorations which jobs seems would be undertaken by Chinese. This would be another reason why the US and its allies should want to fan instability in the region. Afghanistan is a country where the US wanted to establish a foothold of influence to be expanded further to Central Asia. It invaded Afghanistan to change Taliban regime in 2001 but has miserably failed. After wasting 14 years and trillions of dollars of taxpayers’ money which literally has gone down the drain, Taliban still rule the roost. Their recent advances in areas close to Central Asia and NATO’s senseless bombing of a civilian hospital in Kunduz shows the frustration the US is undergoing for an unsuccessful Afghanistan adventure. Pakistan was a key to the solution of problem of Afghanistan with Taliban brought around for negotiation which was sabotaged by RAW and NDS because India would not allow Pakistan’s influence through the Taliban. Pakistan is being expected to bomb Afghan Taliban and bringing them to negotiations at the same time. A stable Afghanistan effectively means Pakistan’s increased role in development and reconstruction of the country leading to enhanced level of influence. With Iran hinting its willingness to join CPEC and Russia to tag along, CPEC can build a new economic alliance in the region comprising the partners like China, Pakistan, Iran and Russia. This could potentially be detrimental to the interest of India and the US in the region. It would be nightmarish to see Pakistan warming up to Russia, particularly when Russia has shed its isolation and set the boots on the ground in Syria. The upcoming visit of Pakistan’s delegation to the US would be tough, challenging and interesting. It would be more interesting to see how Pakistan’s tactical nukes govern its strategic relations with its erstwhile ally.